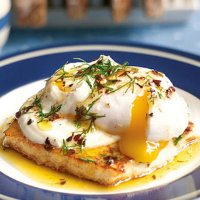 At The Providores, one of our most popular breakfast dishes is one I picked up in Istanbul. It's called çılbır but my Turkish friend's grandmother called it "prostitutes eggs" because (like the Italian puttanesca, or whore's sauce) it's a dish so simple, a respectable housewife wouldn't dream of serving it to her family. Put the garlic in a bowl with the yogurt and 25ml olive oil; whisk together until combined, then set aside but don’t chill. In a small pan, heat the butter until it becomes golden with a nutty aroma. Take off the heat and add the chilli flakes, swirling the pan gently as they sizzle. Add 25ml olive oil, set aside and keep warm. Heat a wide, non-stick frying pan; when hot, drizzle in a teaspoon of olive oil. Add the Halloumi and cook for 2–3 minutes on each side until golden brown. Turn the heat off, leaving the Halloumi in the pan. Meanwhile, bring a wide saucepan of water to the boil. Add the vinegar and no salt. Turn the heat down to a simmer. Break an egg into a tea cup. Gently tip the egg from the cup into the simmering water; repeat with the remaining eggs. Don’t drop them in the same place or they will stick together. After 2 minutes give the water a gentle swirl with a long-handled spoon. They will take about 4 minutes to poach. To serve, stir the dill into the chilli butter and grind in a little black pepper. Place a slice of Halloumi on each of 4 warmed plates. Spoon three-quarters of the garlic yogurt over the Halloumi slices. Remove the eggs with a slotted spoon, lay them briefly on a clean tea towel to soak up the water, then place on the Halloumi. Spoon over the remaining yogurt and the dill chilli butter and serve with toast. The combination of nourishment and vivacity in this dish finds its match in a lemon and lime soft drink.